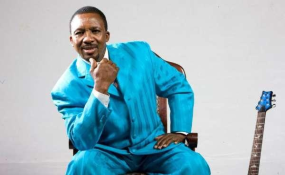 Controversial televangelist James Ng'ang'a of Neno Evangelism Centre has been charged in court with threatening to kill TV journalist Linus Kaikai and incitement to violence. Pastor Ng'ang'a was charged at the Kiambu Law Courts on Tuesday morning and released on a Sh200,000 cash bail or Sh300,000 bond. The televangelist was arrested on Sunday night and taken to the headquarters of the Directorate of Criminal Investigations (DCI) on Kiambu Road. This after he released a video clip in social media issuing threats of unknown consequences against the journalist who had criticized rogue preachers and called for regulation of the religious sector, including a requirement of higher education for clerics. Mr Kaikai, while appearing on Citizen TV News Gang show, urged the Kenyan government to emulate Rwanda which has passed strict laws on the conduct of Christian churches and preachers. Preacher Ng'ang'a quickly responded by posting a self-recorded video in which he bashed Kaikai for his comments. "Ni daktari hapa ambaye hajuwi kusoma na kuandika; kwanza nashukuru wale ambo hamjui kusoma sababu mbinguni hatuendi na kisomo; hakuna degree itapima mlango wa mbinguni na vile vile niwapongeze wale mumesoma you are doing good," the pastor says in the video. He then adds: "lakini kusema kwamba wale hawana degree wakatazwe kuhubiri kama Rwanda, this is Kenya not Rwanda na wewe news anchor unaongea hivyo kwa nini? Hamuwezi kutublock sisi watu hatukusoma tubaki kuosha barabara, please separate preaching and news anchoring."